MEXICO CITY -- Servando "La Tuta" Gomez, one of Mexico's most-wanted drug lords who terrorized the western state of Michoacan as head of the Knights Templar cartel, was captured early Friday by federal police, according to a Mexican official. Gomez was arrested in the capital city of Morelia without a shot fired, said the official spokesman, who talked on condition of anonymity because he was not authorized to discuss the case. The 49-year-old leader of the Knights Templar, a quasi-religious criminal group that once ruled all of Michoacan, controlling politics and commerce, evaded capture for more than a year after the federal government took over the state to try to restore order. The Mexican government had offered a $2 million reward for his capture. It was not immediately clear who, if anyone, has taken over the cartel in Michoacan, where deadly conflicts continue between former "self-defense" groups and clashes with federal police. The folksy and charismatic cartel leader of puffy cheeks and large nose, known to wear a baseball cap and a gray-haired goatee, was a fugitive also wanted in the United States for conspiracy to import and distribute cocaine. The arrest comes at a time when the Mexican government needed a win. President Enrique Pena Nieto has faced a political crisis since 43 college students disappeared last fall at the hands of local authorities, and conflict of interest scandals emerged involving his personal home and that of his treasury secretary. The week started off rough, with Oscar-winning Mexican director Alejandro Gonzalez Inarritu saying in his acceptance speech that he hoped Mexico could get the government it deserves, followed by Pope Francis referring to drug trafficking in Argentina as a "Mexicanization" of the country, and Donald Trump urging people not to do business in Mexico. Pena Nieto's government has been aggressive in capturing top drug lords, including the biggest capo, Joaquin "El Chapo" Guzman, a year ago. Gomez was particularly crafty and vocal. Tapes showing him meeting with elected officials, journalists and other influential people were leaked during his time on the run, including his meeting with the son of the former governor, Fausto Vallejo, a member of Pena Nieto's Institutional Revolutionary Party, or PRI. Vallejo resigned last year for health reasons. Vallejo's interior secretary, Jesus Reyna, and other officials, have been jailed for alleged connections to the cartel. Gomez rose from schoolteacher to one of Mexico's most ruthless and wanted cartel leaders, dominating for a time Mexico's lucrative methamphetamine trade and controlling his home state through extortion, intimidation and coercion of business and political leaders. 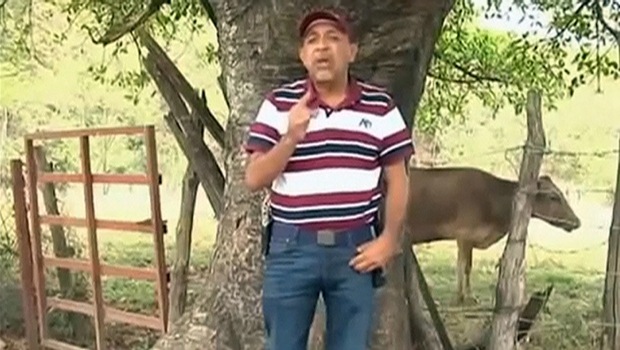 Though it started with drugs, his gang eventually took over the state's international port, Lazaro Cardenas, and made millions from illegal mining of ore.
Gomez gave a British television crew an interview in January 2014 even as the government was mounting a major assault on his gang that eventually led to its demise. He told the reporter that his illegal work was all about business. "As we told you, we are a necessary evil," Gomez is seen telling a group of townspeople on tape. "Unfortunately or fortunately we are here. If we weren't, another group would come." Gomez's long reign was untouched by several earlier attempts by the federal government to send troops and police to regain control of the state, and only began to unravel when a band of vigilantes decided in early 2013 to take up arms and do what the local government wouldn't. The "self-defense" groups, some of the members farmers and ranchers, others alleged rivals and former cartel members, marched through the Knights' territory, taking town after town and finally forcing the federal government in to mount a real offensive to find Gomez and other Knights Templar leaders. Gomez accused them of being sent by a rival cartel in neighboring Jalisco state. Gomez called the Knights Templar a "brotherhood," and boasted of its Robin Hood-like quality, saying the gang's members were born to protect the people and give them back what was rightly theirs. In truculent videotaped statements, Gomez regularly accused the federal government of supporting his rivals and offered to strike peace deals with authorities. The celebrated outlaw popped up often either haranguing troops over radio frequencies or phoning in to a local TV or radio station. Born Feb. 6, 1966, Gomez started as a grade-school teacher in the Michoacan hill town of Arteaga, and was still listed on a payroll at a school there, at least until 2009. Hence his additional nickname of "El Profe" - The Professor. In his hometown, some residents praised him as a humble man who ambled about in sandals and would give poorer people money for food, clothing and medical care when they were in a jam. They said he mediated disputes such as a traffic accident or child support battles. Gomez apparently started out transporting marijuana before becoming in the mid-2000s a top leader of La Familia, another cult-like cartel and predecessor of his Knights Templar. He continued his populist tendencies while acting as a sort of de facto spokesman for that gang, which was led by Nazario "El Chayo" Moreno Gonzalez, Jesus "El Chango" (The Monkey) Mendez Vargas and Dionicio "El Tio" (The Uncle) Loya. La Familia initially portrayed itself as a crusader gang, protecting communities from the Zetas cartel. Witnesses say La Familia trained its recruits in ultra-violent techniques like beheading and dismembering victims, and it frequently ambushed soldiers and federal police. A U.S. Justice Department indictment in 2009 said Gomez might be behind the murder of 12 Mexican federal law enforcement officers whose bodies were found in July of that year while he still operated under La Familia. After the government claimed that the cartel's top leader, Moreno, had been killed in a shootout with police in late 2010, the gang weakened. One faction sought help from its old foe, the Zetas. Gomez turned on his old bosses and started the Knights Templar. He continued to work with Moreno, who was not killed as the government had claimed. No body was found. Moreno was killed last year in a second assault by the government, which this time produced the body. The other leaders of the gang have been arrested or killed, and Gomez was the last hold-out, leaving speculation that maybe he had negotiated a deal with the government. As the leader of the Knights Templar, Gomez claimed he was a "high-class" criminal. He issued pocket-size booklets of the cartel doctrine that were distributed in buses in 2011 as the cartel sought to create a social base. The "code of conduct" claimed it was fighting a war against poverty, tyranny and injustice, while being blamed for murders, extortion and drug trafficking. In an interview with MundoFox, News Corp.'s Spanish-language network, Gomez acknowledged he had committed many crimes but said he never killed an innocent person. He also said he was not scared of dying, because he would choose being killed over going to jail. His videotaped speeches hit hundreds of thousands of views on YouTube. One of them shows him sitting at a desk. On the wall behind are portraits of Ernesto "Che" Guevara, Mexican revolutionary Pancho Villa and Mexico's flag. On the table is the manifesto of Moreno. Gomez accused the government of losing sight of the rule of law in Michoacan.